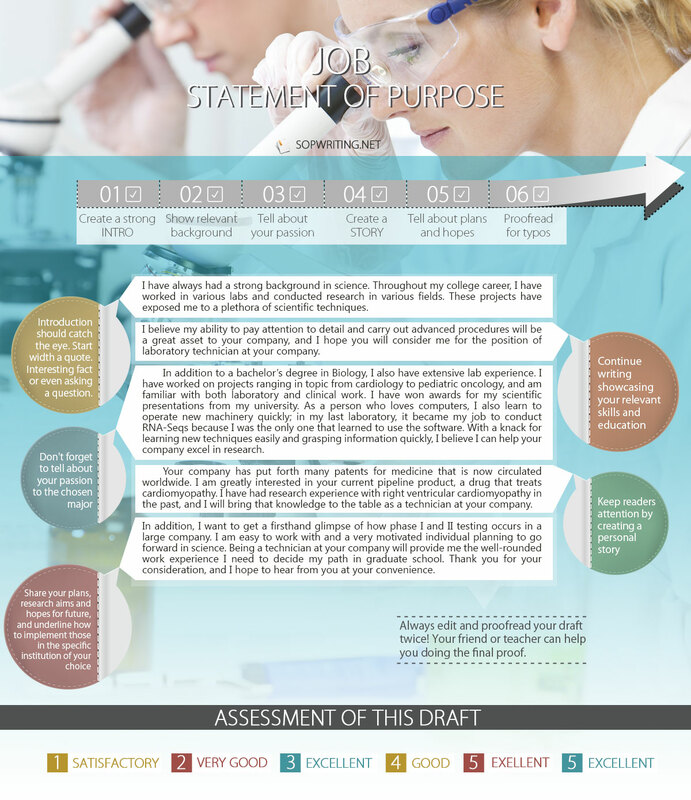 What is the best way of writing Statement of purpose sample for job application? 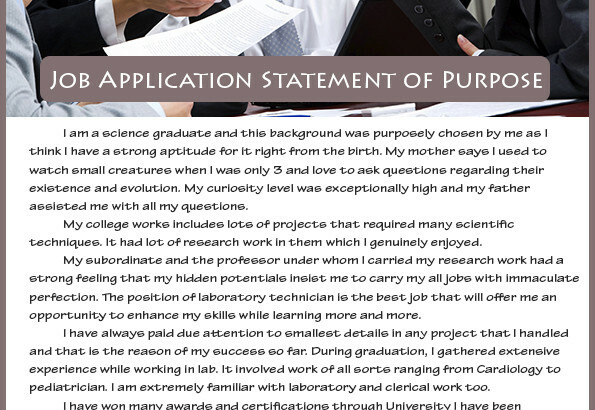 What is your purpose of writing statement of purpose for job application sample? You clearly need to describe here your aspirations as in what provoked you to leave your previous job and join the existing one. How your qualification, experiences and eligibilities suit the selection committee’s requirements? 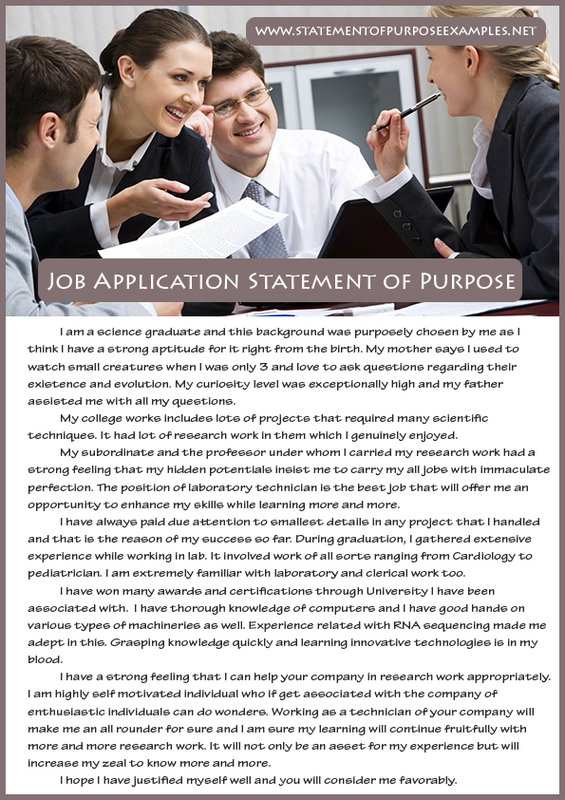 Have a look at other example of statement of purpose for job application. I am a science graduate and this background was purposely chosen by me as I think I have a strong aptitude for it right from the birth. My mother says I used to watch small creatures when I was only 3 and love to ask questions regarding their existence and evolution. My curiosity level was exceptionally high and my father assisted me with all my questions. My college works includes lots of projects that required many scientific techniques. It had lot of research work in them which I genuinely enjoyed. My subordinate and the professor under whom I carried my research work had a strong feeling that my hidden potentials insist me to carry my all jobs with immaculate perfection. The position of laboratory technician is the best job that will offer me an opportunity to enhance my skills while learning more and more. I have always paid due attention to smallest details in any project that I handled and that is the reason of my success so far. During graduation, I gathered extensive experience while working in lab. It involved work of all sorts ranging from Cardiology to pediatrician. I am extremely familiar with laboratory and clerical work too. I have won many awards and certifications through University I have been associated with. I have thorough knowledge of computers and I have good hands on various types of machineries as well. Experience related with RNA sequencing made me adept in this. Grasping knowledge quickly and learning innovative technologies is in my blood. I have a strong feeling that I can help your company in research work appropriately. I am highly self motivated individual who if get associated with the company of enthusiastic individuals can do wonders. Working as a technician of your company will make me an all rounder for sure and I am sure my learning will continue fruitfully with more and more research work. It will not only be an asset for my experience but will increase my zeal to know more and more. I hope I have justified myself well and you will consider me favorably. If the flair of this writing suits your statement of purpose sample for public health, personal statement for MBA, sop for mba application and job application requirements, contact us to get a sample written for you. It would be our privilege to assist you with. 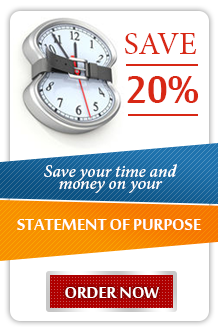 Its right time get an influential statement of purpose written through experienced writers.